Right-click the technical indicator data on the graph to access the technical indicator context menu. Bring to Front: Displays the data on top of other chart objects. Send to Back: Displays the data behind other chart objects. Link To Excel: Lets you copy data you can then paste into Excel. Current Value: Current value of the technical indicator. Previous Value: Previous value of the technical indicator. You specify how many bars to copy. Delete All: Removes links you have pasted in Excel. Link To X_TRADER: Lets you copy data you can then paste into X_TRADER. 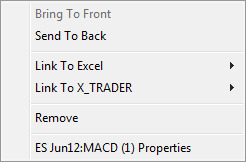 Delete All: Removes links you have pasted in X_TRADER. Remove: Removes the technical indicator from the chart. [Contract]:[Indicator] Properties: Displays the Properties dialog box where you can change the appearance of the Technical Indicator.